Department of Medical Education (DME) of the CPSP is the hub of all academic activities and was established in 1979 in collaboration with the World Health Organization (WHO).It was designated as “National Teachers Training Centre” by the government of Pakistan in the same year. It got designated as “WHO Collaborating Centre for Training in Research and Educational Development of Health Personnel” in 1996 and enjoys this position to date. The DME, besides performing other functions, initiated two diplomas in 2004: one in Health Professions Education (HPE) and second in Health Care Systems Management (HCSM). HPE was upgraded to college membership in 2009 while HCSM was upgraded to membership level (MCPS) in 2014. Transform healthcare delivery into an effective and efficient system, which could provide equitable and affordable access to the masses of the country. To educate and train healthcare professionals for administrative and management positions and leadership roles to organize, manage and monitor health delivery facilities and provide an effective and efficient system of health delivery. Impart knowledge and skills to healthcare professionals in healthcare systems management. The goal will be achieved by providing & testing knowledge in a structured manner through semester based program. The program has been designed for candidates interested in pursuing their career in healthcare management. It is geared towards those working in public or private healthcare organizations; such as teaching institutes, hospitals, community based organizations and non-governmental organizations. It prepares students in becoming effective leaders and managers for managing health care delivery and becoming an agent of social change. Combination of contact sessions and supervised learning approach; providing opportunity for skill enhancement and on-the-job application. Application to government sector, international agencies, private sector and other healthcare organizations. The curriculum follows the principles of adult learning. This enables the participants to activate prior knowledge and assimilate new information presented in a structured format for on job application. A blend of constructivist, cognitive and experiential learning philosophies is employed for teaching and learning. It is the combination of contact sessions and supervised distance learning. The strategies adopted in the program, encourage critical thinking, analytical skills and application of knowledge. The course is developed in the context of current management issues faced by healthcare professionals and provides opportunity for practical application of concepts in real life situations. The education material focuses on the REST approach, whereby research, education and systems are followed by training at the work place. Enable the students to learn the fundamentals of research. Undertake research on issues related to healthcare management, Public Health and policy. Write reports, publishable research articles and/or dissertation. Enable the students to communicate (verbal and written) effectively and learn the concepts of Public Health. Understand the principles of adult learning, developing and evaluating educational activities and student assessment. Enable the students to adopt systems based approach towards management of healthcare organizations. Focus on various components of healthcare systems through structured learning. To apply learned concepts for improving management at the work place through Supervised Learning Assignments (SLA). Write reports on the changes implemented along with justification for changes, resistance encountered and measures taken to overcome. Conduct original research on Management/Public Health issue pertaining to the workplace area of residents. Use scientific and evidence based approach for provision of quality healthcare, which is efficient and cost-effective. Apply epidemiological and statistical concepts for better planning and management of health related issues. Apply principles of financial management, allocation of resources, priority setting and decision making. Use health information systems and technology for effective management of healthcare organization. Market healthcare services focusing on consumer behavior and needs. Apply concepts of human resource management in order to optimize performance. Effectively manage healthcare systems at different levels of care to achieve organizational goal and objectives. Preference will be given to those candidates who have at least two years post-graduate experience. Duration of this program is two years spread over six semesters. Each year is divided into 3 semesters of 4 months’ duration. The first month of first five Semesters commences with a contact session extending for 2-3 weeks. Classes during the contact sessions are conducted from 08:30 am to 5:00 pm, Monday through Saturday. In the sixth semester, there is no contact session and the time is utilized in completion of Research work and dissemination of findings through a research paper published or accepted for publication in CPSP approved journal or through writing dissertation on an area of management or public health. consisting of various courses directly or indirectly related to Management or Public Health. Research is an integral part of the Membership program in HCSM and students are required to pass courses of Biostatistics, Epidemiology and Research Methodology inclusive of qualitative research. SPSS training is also imparted to the students for data entry and analysis. Students are required to complete a 6 credit hour research project. 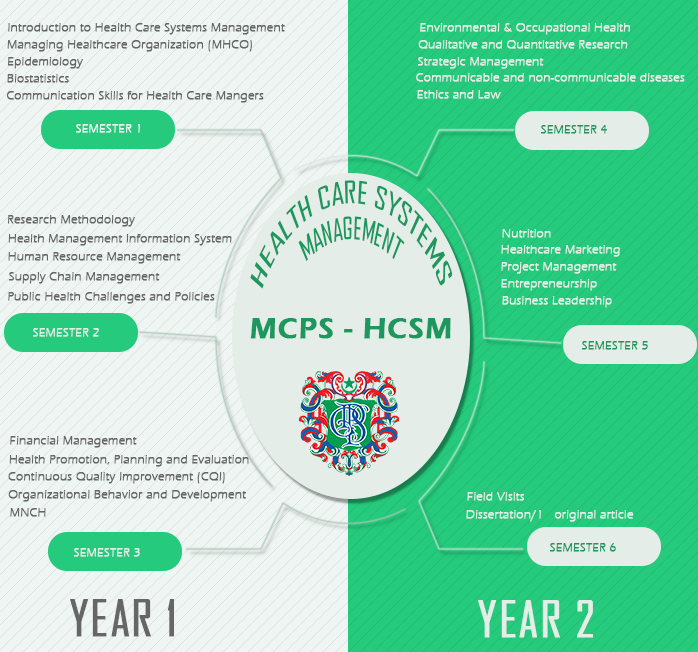 The student shall be admitted to the “Membership of the College in Healthcare Systems Management (MCPS–HCSM)” by the CPSP Council upon successful completion of all the courses offered in the program with CGPA of 3.00 or above and evidence of an original article published/accepted to be published in CPSP approved Medical Journals. If a student secures CGPA of less than 3.00, he/she will be required to retake any course/s with grade points less than 3.00 to increase the GPA to a minimum required level of 3.00. Individual transcript for the semester taken shall be issued to the student at the completion of each semester. This transcript shall not be an official document to produce for credit hours, transfer or employment purposes. Provisional certificate shall be issued to the student by the college after successful completion of all the semesters of the program and research with minimum CGPA of 3.00. Final transcript shall be issued after successful completion of the program, which includes and will present a comprehensive and detailed record of the courses taken i.e. GPA obtained in each semester and the cumulative GPA. Successful students who are elected by the college council as diploma holders are honored by offering them a diploma certificate in yearly held convocation. Examination department will notify the students in this regard. Payments must be made in the name of “College of Physicians and Surgeons Pakistan” through pay order or demand draft or UBL Challan at HQ.